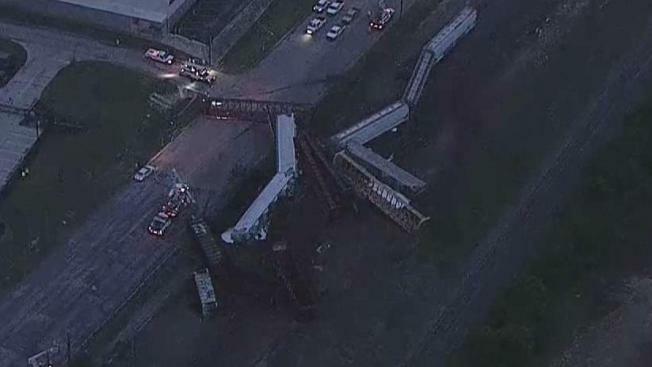 Fort Worth firefighters say a portion of North Main Street will be closed until Wednesday night after a freight train ran off its tracks earlier in the morning. About 40 rail cars rolled south from a rail yard near Meacham Airport at about 1:30 a.m., authorities said. More than two dozen of those cars derailed on the 4300 block of North Main Street, blocking the road. No injuries were reported and firefighters said there appeared to be no leaks or cargo spills since most of the derailed freight cars were empty. North Main Street was expected to remain closed between Terminal Road to Loop 820 until late Wednesday, firefighters said. Use Blue Mound Road as a detour. The south entrance to Meacham Airport was not affected. At about 6 p.m., officials said the train derailment had been cleared but that heavy machinery would remain on scene into the evening.